Mozilla released the next version of Firefox browser yesterday, Firefox 21 for both desktop and mobiles. The latest Firefox brings several improvements and support for more social providers including Cliqz, Mixi, MSN Now via its Social API, it also brings a Firefox health report. The desktop version also brings the enhanced three state UI for Do Not Track Policy implemented in Firefox. The mobile version comes with open source “Open Sans and Charis” fonts for web content. The mobile version also brings HTML5 improvements and other bug fixes and minor improvements. More social providers are added to the browser, this feature debuted last year with support for Facebook Messenger, the new list of social providers include Cliqz, Mixi and msn Now. Mixi is a social network that has large following in Japan, with the Mixi integration users will be able to see the recent-activity stream of all comments and photos from your network. It is only available to users in Japan. With msn Now you can see what your others are searching, and sharing on the web, MSN scours the interesting trends from the web sources like Facebook, Twitter. You can customize the activity stream according to your preferences. Activate msn NOW. 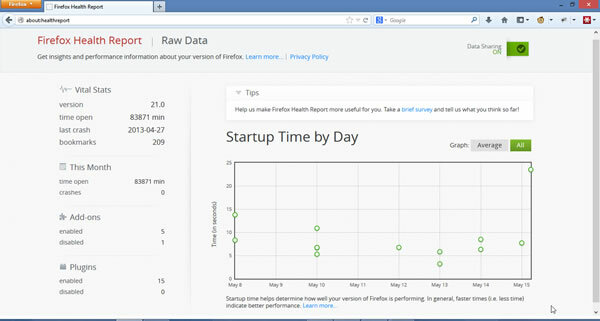 Firefox Health Report is a new feature that came with this version, it includes basic health information about your browser, in information includes time to start up, total running time, number of crashes if any etc., it will also include tools to understand the issues and fix problems you encounter. Right now the report doesn’t say much but it will evolve over the course of time to include more tools according to Firefox. You can see Firefox Health Report by typing the command “about:healthreport” in the URL bar.